Fifty years ago, each computer maker used its own programming languages to tell a computer what to do. In 1959, a group of programmers devised COBOL, a COmmon, Business-Oriented Language. Programs written in COBOL could run on more than one manufacturer’s computer. 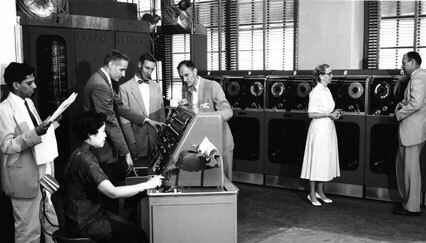 In a 1960 test, the same COBOL programs ran successfully on two computers built by different manufacturers. A small group of programmers from the computer industry and its clients wrote the new language of COBOL. Both corporations and government agencies needed to maintain payrolls, prepare budgets, and track property, traditional aspects of business data processing. The Department of Defense was especially interested as it was one of few organizations to buy computers from different makers. COBOL was quickly adopted there, in other federal agencies, and in private industry. Additional common languages, such as ALGOL and standard forms of FORTRAN, were developed for scientists and engineers. Written initially for the short range, COBOL proved so useful that it dominated much of government and business data processing for decades. Millions of banking transactions are still processed daily with COBOL programs. As the use of common programming languages became standard, a flourishing independent computer software industry emerged.